Andrew Stemple Richard Kirkpatrick, 42, is part of team "Shovelin' Elvi" at the snow shovel races. 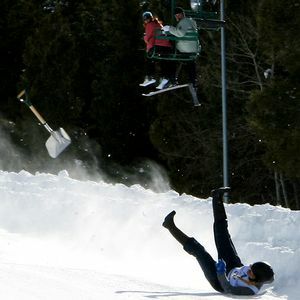 ANGEL FIRE, N.M. -- What goes up must come down -- in wild, blazing speeds at the 2011 Snow Shovel Races. Adrenaline junkies and curious first-timers fly by the seat of their pants on metal grain snow shovels, legs up, steering with their hands pressed in the snow down a 1,200 foot-long mountain track, vying for the best time out of two runs. 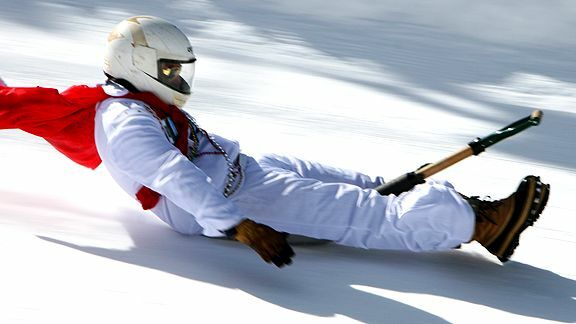 Part whacked-out sledding, part unconventional luging, this extreme sport came to be from ski resort workers using shovels as sleds to get from one place to another in the 1970s. It evolved to become an intense competition, with tricked-out shovels and high speeds leading the way. Modified shovels were banned when the sport returned after a five-year hiatus last year due to accidents and safety concerns for riders barreling downhill at speeds upward of 90 mph. "There's certainly a point of no return," noted contender Accel Corral, a recording engineer from Las Vegas. "It's like 16 seconds in a snow globe, handled by a demonic child, and you're holding on for dear life." Jeff Hamblin, 51, stands as the man to beat, but he's not resting on last year's laurels. "I've got the secret sauce and the magic dust," the speed demon said with a grin as he showcased his container of wax and bag of powder. He's wearing a yellow one-piece latex luge suit, sneakers and a heavy-duty helmet. Andrew Stemple Page 2's correspondent wipes out on the course. Texas competitor Richard Kirkpatrick, 42, dresses as Elvis and carries his "beads for speed," part of team "Shovelin' Elvi." "We're like Nicholas Cage, we want to be flyin' into town," he said, referring to the 1992 movie "Honeymoon in Vegas." "These are my hunka hunka burnin' gloves," added teammate Logan Orndorff, 44, whose gloves couldn't save him on his second-run wipeout. Wrecks and war stories were hard to avoid. "I was linear like a lightning bolt," wide-eyed Jay Greaves recalled, "then I went into a terrible tail spin. The shovel finished, I didn't." Preparing for my own descent, I'm having all sorts of cold feet. In my first run, I reach 50.96 mph, temporarily posting the top female time of 19.97 seconds. How could I have heard so many horror stories? It's just sledding on a shovel! John Strader, 42, broke his jaw, back and leg in the Winter X Games in 1997, as well as cracked his sternum and bruised his heart. He gave me a last-minute pep talk: "Stay on the shovel." Total confidence mid-course quickly spiraled into a 360-degree spin, yet somehow I regained forward motion until losing control again, slamming into the snow bank barrier. I felt like a crash test dummy. "I was a stuntwoman for 20 years," ski patroller Jamie Elliot said before the race, noting her work in such films as "RoboCop" and "Dante's Peak." She then added, "And I won't go near shovel racing. It's crazy. You have no control." I was disqualified and disheartened, seeing birds, stars and the ski patrol beckoning me to fetch my shovel. On my third run, things went downhill when I spun out at the finish line and tumbled end-over-end like a rag doll. Lying face down, I was unable to lift my head from throbbing pain in my upper body. The ski patrol loaded me on a stretcher and hauled me off the mountain and into the first aid tent. There, I was told I pulled my sternocleidomastoid muscle, which runs from your ear down to your heart, and had bruising near my collarbone and deltoid but thankfully no concussion. Just a headache the size of Oklahoma. The doctor referred to it as whiplash, a bad car accident. Felt like I was dumped from the back of a pickup truck. The secret sauce and magic dust paid off for Hamblin, who won honors for the top speed of 73.21 mph. Shovel racing royalty Kelly Haukebo, who fractured her wrists at this same race seven years ago, won the women's event, clocking in at 68.57 mph. The races ended, sending shovels back to equipment for chores instead of vessels for victory. Katie Barry is a freelance writer in New York. She can be reached at LadyKatieBarry@gmail.com.